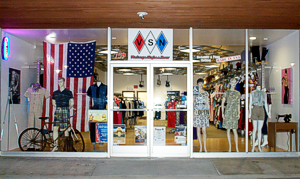 Throwback in style with ..
Vintage Styles Now is located on the newly renovated BLVD in Lancaster Ca. We are located directly across from LPAC on the north side of the BLVD west of Battlegroundz and MDM Architects. There is parking available in front of our store on the BLVD and additional parking behind us. Our store is only accessible from the BLVD, but visitors who park behind the BLVD are welcome to pass through Battlegroundz to reach us.